Is a concrete building necessarily more permanent than one made out of paper tubes? Japanese architect Shigeru Ban questioned the assumption that a longevity of a building depended solely on its material when he spoke at the Japan Society in New York city today. He observed us how developers often spent so much money and resources to tear down perfectly fine buildings to build new ones. In comparison, his “temporary” Takatori Catholic Church still stands today, some two decades on. 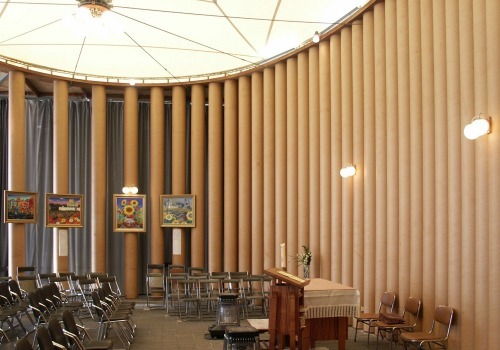 Originally built in Kobe, Japan, after the Great Hanshin earthquake of 1995, it was deconstructed a decade later when the church needed a bigger building. They then donated Ban’s building to Taiwan’s Nantou County, where it has become a community centre and tourist attraction known as the Paper Dome. It’s a reminder that a building’s permanence often lies outside its construction materials or even design. How a building is regarded in the eyes of those living in it is often what determines how long it stands. What did a dot see on New York City’s streets? Produced for Adam Levy and Joshua Hume’s Video Essay class at D-Crit.